Role of WEP: WEP was responsible for the well design and supervision during the execution of the project. 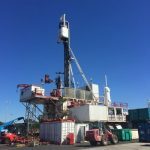 After a period of intensive (engineering) preparations, drilling for geothermal heat has started in August 2016 in Poeldijk, the Netherlands. The DrillTec VDD370.2 VarioRig spudded the first well on August 18th, 2016. Two wells were planned to be drilled forming a geothermal doublet for heating several greenhouses in the Poeldijk area. Drilling and testing operations were finished for Aardwarmte Vogelaer on November 6th, 2016. Wells PLD-GT-01 and PLD-GT-02 were drilled and tested successfully using the DrillTec Vario rig. Well Engineering Partners provides engineering during the preparations and drilling management during the execution on behalf of Aardwarmte Vogelaer.